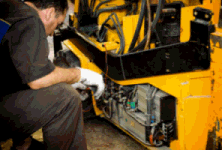 We Offer Servicing on all Forktrucks. Regular servicing is the key to reliaility. We recommend that all trucks should be serviced at least once every year. We have held our prices for servicing. please call for prices today! Daily Checks which will help to keep your Forktruck up and running! Yearly service contracts/LOLA now required every year. Call us on 01727 821460 or fill in our contact us form today, and will we reply back to you.